Pope Francis urged for an end to war, injustice and inequality on Monday, as he addressed an inter-religious meeting during his historic trip to the United Arab Emirates. 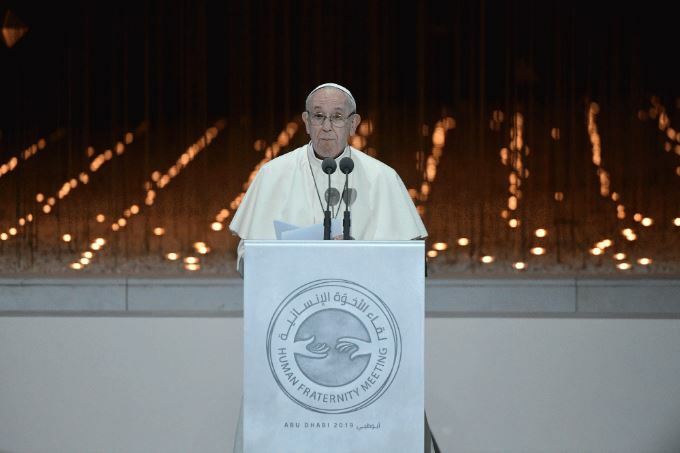 “War cannot create anything but misery, weapons bring nothing but death,” the pope said, addressing hundreds of representatives from different faiths gathered at the Founder’s Memorial, a monument and centre in the UAE’s capital Abu Dhabi. “God is with those who seek peace,” he said. Ahead of his trip, the pope called for an end to the suffering in Yemen. The conflict there began in late 2014 and has escalated into the world’s worst humanitarian crisis, according to the United Nations. The pope also called for religious freedom, as he became the first head of the Catholic Church to set foot on the Arabian Peninsula. “I look forward to societies where people of different beliefs have the same right of citizenship,” he said, underlining his call since becoming pope for more dialogue between Muslims and Catholics. The UAE is an Islamic country, with migrants, mainly from Asia, making up the majority of the population. The Vatican estimates that there are about 900,000 Catholics in the country. Unlike in other Arab countries, Christians are free to practice their religion in the UAE. After his speech, the pope signed a “Human Fraternity document” along with Ahmed al-Tayyeb, the Grand Imam of Al-Azhar, the world’s foremost Sunni Islamic institution and university. Al-Tayyeb called on Muslims to protect Christians in the Middle East, where sectarian violence has caused many deaths over the years. “Continue to embrace your brothers from Christian sects everywhere, as they are our partners in the homeland,” al-Tayyeb said. Earlier Monday, the pope met with Mohammed bin Rashid Al Maktoum, the UAE’s Vice President and ruler of Dubai, and Crown Prince Mohamed bin Zayed Al Nahyan. Both leaders attended the inter-faith meeting. Francis also visited the Great Mosque, accompanied by the Great Imam of al-Azhar, before paying his respects before the tomb of the founder of the UAE. On Tuesday, roughly 130,000 worshippers are expected to gather in a sports stadium – many coming from neighbouring countries – for an open-air Mass with the pope.